This is a 2-part tour* that combines the new part of town with the historic. We start just on the edge of town where you'll visit some of Almonte's most innovative entrepreneurs. You’ll see and learn how things are made and of course, you will be eating and drinking the finished product! For part 2 of the tour we'll take a short 1.5 km drive to the original, historic part of Almonte nestled along the beautiful Mississippi River. As you eat your way down Mill Street you will experience the gorgeous architecture and natural beauty of Almonte, and you will hear about its storied past and culture of today. * Please ensure you have transportation to get to the second half of the tour. We'll start at the Equator Coffee Roasters where you will enjoy sampling locally roasted organic, fair-trade coffees and see how roasting can bring out different flavour profiles. 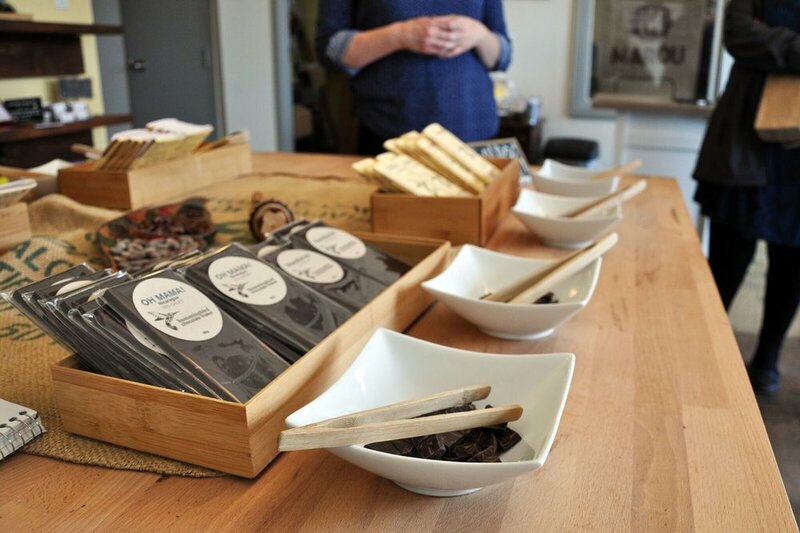 Then you'll savour some of the world’s best award-winning chocolate at Hummingbird Chocolate. Need we say more?! Once in the historic side of town, you’ll nibble carefully chosen artisanal cheeses and pairings by Lise and Sandraat Pêches & Poivre followed by a little bit of France with savoury crepes at the Mill Street Crepe Company. Finally, we’ll finish up the tour with tea and buttery scones at Gwendolyn’s Tea & Cake tea room. The tour starts in front of the Equator Coffee Roasters at 451 Ottawa Street in Almonte. Click on the map indicator to access Google maps and get directions. Free parking is available out front. This part starts at the Almonte Old Town Hall. Parking is available there or on nearby streets. Below are the most common questions we get asked about this tour. If you have other questions check out our FAQ or contact us by email. The tour provides food equal to a good-sized lunch. Guests leave comfortably full after our food tours. No, there are no alcoholic beverages on this particular tour. We walk at a leisurely pace. The tour covers approximately 1.5 to 2 kilometres of walking. At most locations we will be sitting down, however there will be some locations where we will be standing. The experiences are organized to arrive at each tasting location at a specified time, therefore it is important to stay on schedule so the food is freshly prepared for the guests. Having said that however, occasionally there may be time for making purchases along the tour. Please check with the guide first.